High blood pressure can increase your risk for heart disease, kidney disease, stroke and blindness. One-third of American adults have high blood pressure, and another 28 percent are prehypertensive, or at risk for high blood pressure, according to the National Heart, Lung and Blood Institute. 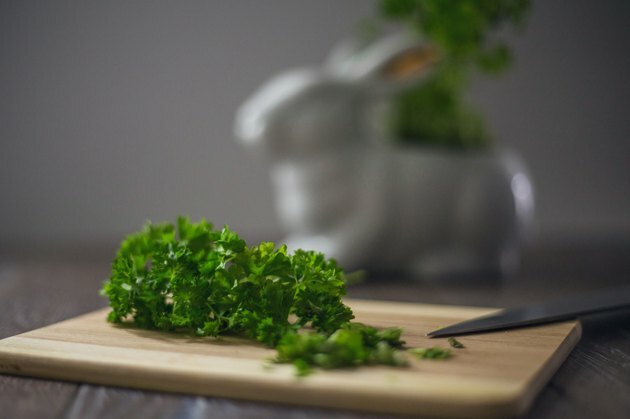 A healthy diet supports lower blood pressure, and parsley can be a flavorful component of a blood pressure-lowering diet. A low-sodium diet can help lower or prevent high blood pressure, according to the National Heart, Lung and Blood Institute. Fresh parsley is a low-sodium herb containing only 34 milligrams of sodium per cup. It can fully or partially replace salt and other high-sodium seasonings and condiments to flavor your food. Healthy adults should consume no more than 2,300 milligrams of sodium per day, and a low-sodium diet for individuals with high blood pressure should limit intake to 1,500 milligrams. Try a soup with low-sodium broth, beans, vegetables and parsley. Maintaining a healthy weight can help prevent high blood pressure, and losing weight if you are overweight can help you lower high blood pressure. To lose weight, you need to consume fewer calories than you expend. Fresh parsley can be part of a weight-loss diet because each cup contains only 22 calories. Use it to replace higher-calorie flavorings, such as butter in mashed potatoes. The Dietary Approaches to Stop Hypertension eating plan may help lower high blood pressure, according to the National Heart, Lung and Blood Institute. The plan limits meat and sugars, and it includes plenty of fruits, vegetables, whole grains, reduced-fat dairy products and nuts. Use parsley to make DASH-compliant dishes, such as fish stew with parsley and tomatoes, olive oil, garlic and onion. Another option is tabouleh, which contains parsley and the whole grain bulgur. Diets high in dietary fiber, calcium, and vitamins A and C may help prevent high blood pressure, according to a study published in June 2013 in "Nutrition Research and Practice." A cup of chopped fresh parsley provides 3 grams of dietary fiber, or 12 percent of the daily value based on a 2,000-calorie diet, 8 percent of the daily value for calcium, 101 percent of the daily value for vitamin A and 133 percent of the daily value for vitamin C. For a snack high in these nutrients, dip raw vegetables into a mixture of Greek yogurt, parsley and chives.